The University of Virginia Board of Visitors today announced the authorization of the “Cornerstone Grant,” an initiative providing significant cost-of-attendance relief to qualifying middle-income, full-time Virginia undergraduate students. The board also approved plans to increase undergraduate enrollment by up to 100 Virginians in the coming academic year. Initial funding for the Cornerstone Grant, estimated at $15 million over the next three years, will be provided by the University’s Strategic Investment Fund. After the initial three years, funding for the initiatives will be incorporated into the annual operating budget through a combination of operational savings, private philanthropy and/or other private revenue sources. The initiatives are part of a multiyear strategy to enhance access and affordability for in-state undergraduates at the University – already recognized as one of the best values in higher education. “Our strategy for access and affordability keeps UVA on a sustainable financial path that increases quality, opens our doors wider to Virginians and cements our commitment to fully meet the needs of admitted students without any pre-screening of their family financial situation,” President Teresa A. Sullivan said. UVA’s board laid the foundation for the new initiatives in 2014, when it established a special committee to develop recommendations for a sustainable model to support an affordable, high-quality education through an integrated approach to tuition, financial aid and the operating budget. A key result of that work was “Affordable Excellence,” a program that reduced the net cost of a UVA education for 70 percent of qualifying Virginia families and significantly reduced need-based loan caps for lower- and middle-income families. An ad hoc committee on the Strategic Investment Fund, established in 2016, extended this work by identifying two key objectives to further enhance UVA’s commitment to access and affordability. The first objective was to begin the process of permanently endowing the cost of student aid so that, over time, tuition would no longer be used to fund UVA’s financial aid program. That objective was addressed with the establishment of the Bicentennial Scholars Fund, a permanent endowment supporting student scholarships with a potential value of $300 million in philanthropic support and matching Strategic Investment Fund backing over the next five years. The second objective was to enhance financial aid for families whose income is less than $125,000. This objective will be addressed by the Cornerstone Grant. The Cornerstone Grant expands UVA’s financial aid program for qualifying, full-time undergraduate Virginia students from middle-income families. This fall, qualifying first- and second-year Virginians from families with income of less than $125,000 who do not receive grants or scholarships from other sources will be eligible to receive a $2,000 Cornerstone Grant, while similarly qualifying third-year students will be eligible to receive a $1,000 grant. In future years, qualifying new and continuing in-state students with family incomes of less than $125,000 will be eligible for the new grant. The Strategic Investment Fund was authorized in February 2016 to provide transformational investments in the quality of a UVA education without relying on tuition or tax dollars. Areas of emphasis include research, academic experience, access and affordability, and infrastructure. The board’s plans for increasing in-state enrollment project that at least half of the 100 new slots for Virginians will be available to first-year students in the 2017-18 academic year. Admission preference will be provided to applicants to the School of Architecture and the School of Engineering and Applied Science. The remaining new, in-state slots are expected to be filled with a mixture of students, including transfers, distance learners and first-year entrants in spring or summer terms. Since 2011, the University has increased enrollment of Virginia students in alignment with the objectives of the state-approved Top Jobs Act. 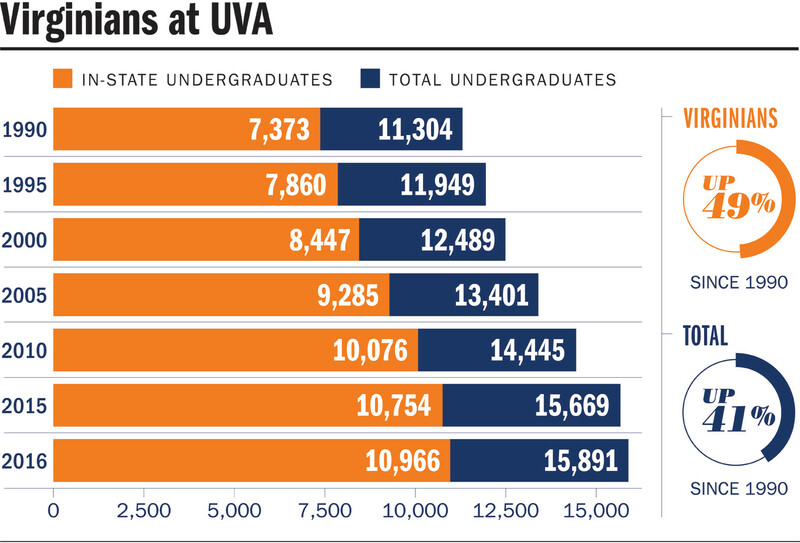 Under those plans, UVA committed to growing enrollment by nearly 1,200 in-state undergraduates through the fall of 2018. U.S. News ranks UVA as No. 2 public institution, No. 24 national institution (public and private), and No. 25 most innovative school in the country. Kiplinger’s ranks UVA as the No. 2 Best Value among public institutions. Money Magazine ranks UVA No. 3 Best Value College. The Princeton Review ranks UVA No. 7 in the Top 200 Colleges That Pay You Back. UVA has the lowest average student debt among Virginia colleges and universities, according to Money Magazine’s Best Colleges Rankings 2016.